Ryan has always wanted his guitar collection mounted on wall hangers – for easy access – and to make his space feel like more of a “man space”. Unfortunately, we’ve never lived anywhere long enough for him to have his own space…until…. NOW!! First Step: Go to Home Depot and gather your supplies. – Heavy duty utility wall hooks -found in the garage organiser section (make sure it wont damage the finish of your guitar). – Some sort of wood! Ryan bought these bull nose caps, used to cap edges of stair treads. They were quality wood, cheap, and the perfect size. Just over $2 bucks a piece. I chopped the wood pieces in half using my chop saw. They weren’t all a perfect length, and some had round edges, some have straight edges. It really doesn’t matter since the guitar will be hiding the wood piece. I am soooo not a perfectionist!!! 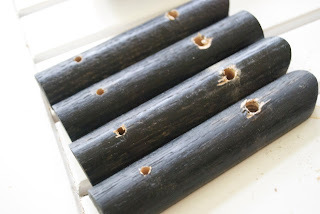 Then I painted them black..
Then I drilled holes for the screws. I measure about an inch and a half from the end. Then I drilled massive holes to fit the wall hook. 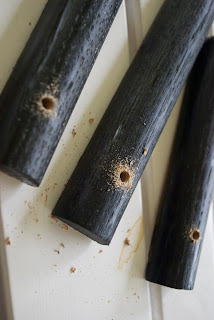 Wish I had a drill press for this, but my hand held drill did it’s job eventually. You can see where the wood split a bit on the edge of the holes. 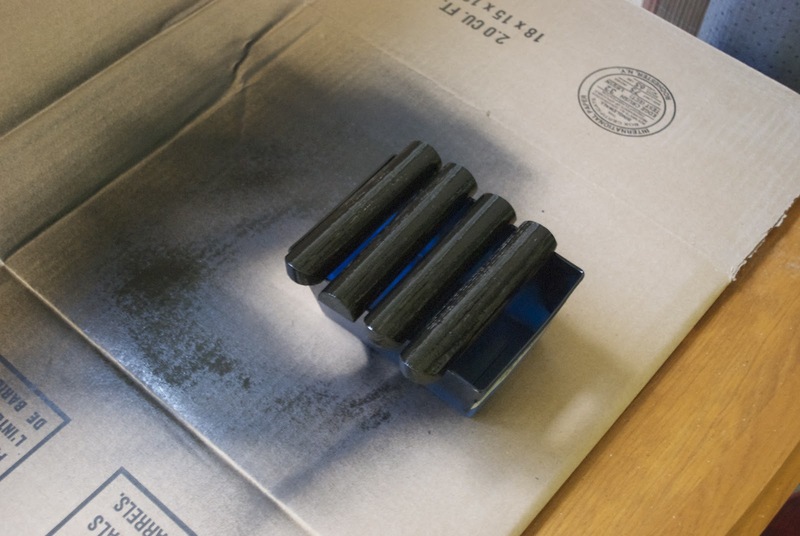 I just sanded it out nice and gave the pieces another coat of paint. I love using painters tape to measure out hanging stuff on the wall. 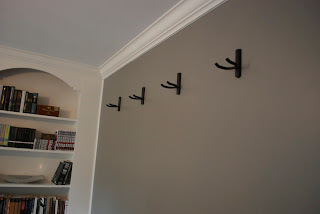 I spaced the hooks about 18″ apart. First I screwed the wall hook into the piece of wood. Then to get them on the wall, I drilled a pilot, hammered my anchor into the wall, and screwed the piece in place. Make sure to use a level to ensure it’s straight. Yup, looks good. Three more to go. 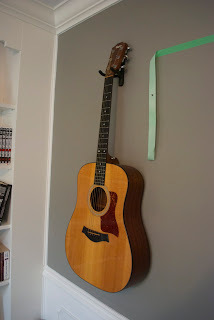 This particular wall hook is a bit big but it holds a standard guitar just fine. 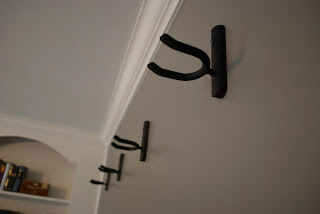 Make sure that the wall hook that you get has adequate padding – an alternate step is to buy vinyl tubing from Home Depot and slide it on the hook – then cut to size. On some more expensive guitars it might be with the extra care to make sure the goop that sometimes occurs with wall hooks – stays off the guitar. So, here they are all up on the wall. 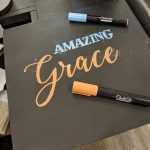 You can snap a chalk line or use a fancy laser lever. 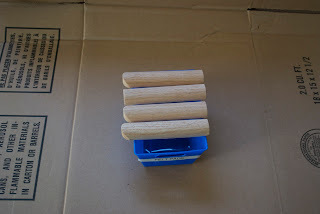 I just used a 4 foot level and painters tape to line up the tops – and then used the level to get the wall hook support bracket (the black spray painted piece of wood) – level from side to side. My son James: yells “MOMMY! 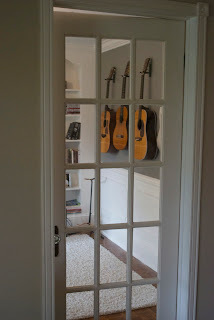 The guitars are hanging up!” He was seriously astonished. Confidence booster for me. Who cares if it comes from a 4 year old! They look awesome from the hallway! That’s it! I never said it was rocket science!! Way cheaper than the store bought wall hangers and they look just as good! 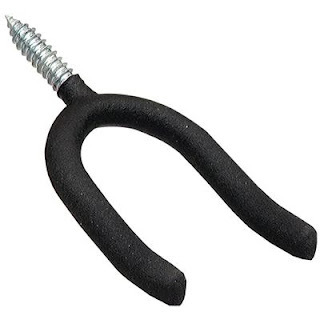 Each wall mount cost less than $4 bucks to make – add another $1 if you are going to be cutting vinyl hose to fit over the hook (highly recommended to protect the neck of the guitar from getting goop on it). These retail at the store any where from $20-45 – the store bought units do have the added security of locking automatically when the instrument is placed on it – some swivel – which can be important if you are hanging a collection of guitars. 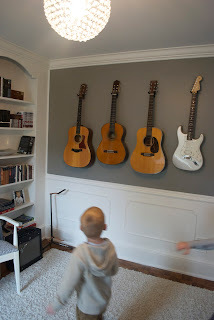 The diy wall hanger is a cheap and easy way to get your guitar collection up on the wall – once you live with them you may want to upgrade to the fancy expensive ones! So after mounting these hangers my husband added 4 more. They work great. As mentioned in the above tutorial – depending on the type of wall hook you buy you will benefit from vinyl hosing or some other solution (perhaps black duct tape) to ensure that your guitar, banjo or whatever else you hang doesn’t get damaged. With a standard home depot “grip tape” type hook, humidity changes cause the glue and grip tape to get all over the neck of your guitar. 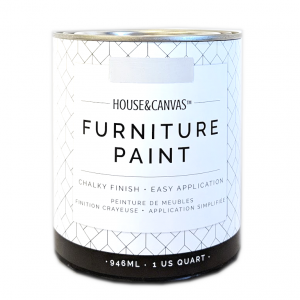 Test out different hooks at home depot – keep in mind that your instrument is going to go on and off that hook a number of times – make sure little bits of gooey stuff is not a problem by examining a few different hooks. We had these hanging in our house until early last year. 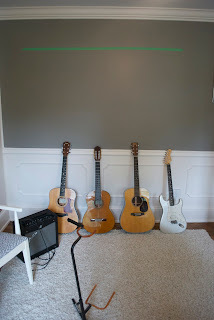 My husband ended up buying guitar wall hangers from a music shop – they lock and swivel which is important for him and his collection – after 4 years he took down the diy hooks and upgraded to Hercules “auto grip” wall mounts . He also bought a 5 guitar display stand because he likes a few “laying around” – a five guitar stand could easily be done with PVC piping. 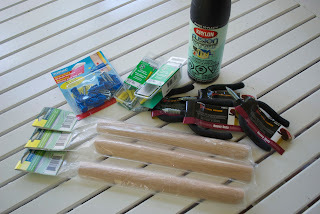 Perhaps a great idea for a future diy post! 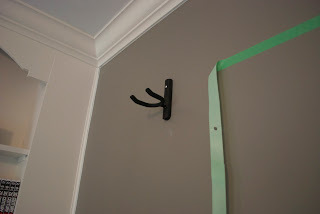 If you are going to buy a hook from home depot to build a DIY wall mount. I recommend one with vinyl coating like the one by Everbilt. The DIY wall mounts work great – just make sure you don’t skimp out on a quality hook – your instrument will thank you! 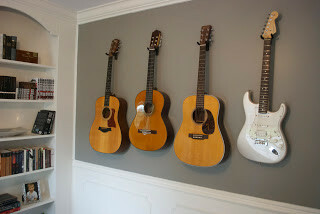 I'm thrifty also and would never have thought putting guitars on a wall could look so stylish, great job! Hi Michelle, I just stopped by your blog. Are you really in Australia??? So cool! Thanks a bunch for reading! awesome. love your wall color, too. LOVE THIS! My musician roommates are going to love me for this 🙂 Found you via Not Just a Housewife link party! so much cheaper than the store bought guitar mounts…. $$$$$$!!!!! Nice way of storing the guitars! I want to imitate this one, maybe with flower pots inside the house. I'm just thinking where to buy inexpensive detachable cabinet shelves. Small ones will do! Aren't they nice to look at the wall? Impressive. This will definitely be helpful when I need additional space for couches but the guitar stands are in the way. Finally, a space-saver hack! Now I can have a place to keep my trusty old Mustang that won't be difficult to go to when I need to, and I can even have some space to keep the extra table to. Man, that's a really cool accessory concept. I wonder how this thing will work if it was used to hold out a TV on the wall or something. A good accessory I should have for my own house. It'll be a great add-on and support for my other stuff, especially when there isn't a lot of space available. Just when I needed a space-saving add-on for all the stuff I have at home. Maybe I can modify it to hold up some of the bathroom accessories I have too. Super nice, if I only know how to play the guitar! Anyways, maybe another storage that needs to be out of reach for kids will do for this project. That one I'm still thinking too. Do these holders apply only to guitars? 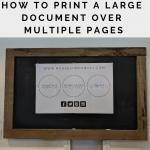 I am thinking of trying it and put some in my home office to accommodate my other stuff. High five! You are so thrifty 😉 and skilled with putting wood stuff together too. I don't know if I can do it. I sort of stay away from anything requiring drilling. I've done bookshelves though, so if I can handle that, why not this? I'll tell you one thing, your picture is inspirational. They look so good hanging up like that. It gives the room a whole different look. My hubby does carvings and I've always wanted to mount them. This post is pushing me to make that more of a reality. Hi Danielle, Thanks for stopping by! You could use these for ANYTHING!!!!! Utility hooks come in all sorts of sizes and colours. What are you thinking about hanging??? Would love to see pics when you are all done! Aw, thanks so much for stopping by and posting your great comment!!! Honestly, these were so easy to make. Don't be intimidated by your power drill!!!! 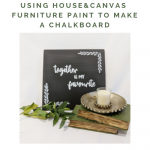 Who says wall art has to be painting and pictures! Carvings would be just as interesting as our guitars!! Good luck and please send pics when you are done! This is a great design for my house wall and a light ambiance to look at. It brings much more space rather than placed your guitar anywhere in the room. Could you tell me what wall color you used? My son wants to paint his room this color. 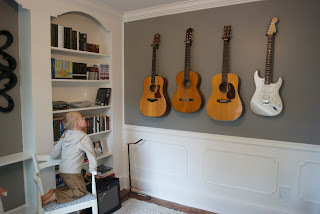 We are also planning on hanging his guitar collection up like this. Thanks! Why not just screw directly into the wall? The wood piece makes no sense to me. The utility hook couldn't be screwed directly into the drywall. It needed an anchor. Yes, the utility hook is screwed into the wood, and the wood is screwed into the wall. Such a good idea! Looking back, I wish that's what I did. My husband has added 2 new guitars to his collection since this post. I have yet to make him more hangers. Wish I could just screw in the hook!!! Such an easy, great idea. We'll be doing this at our new house. How are they holding up (literally)? I might add some kind of strap, but I am a belt and suspenders man. Hey Cait, Awesome work! those look very nice. Feeling inspired to try this route for my home office. I might try adding a couple of sections of fuel hose from the auto parts store (maybe 3/8" long) that fit tightly on the two fingers to act as stops to keep the neck from sliding forward and coming off (an in-expensive adaptation of a design feature seen on some of the store bought ready made solutions).